Buffalo Stampede – The Course: SkyMarathon (42km) 2017 | JustRunLah! 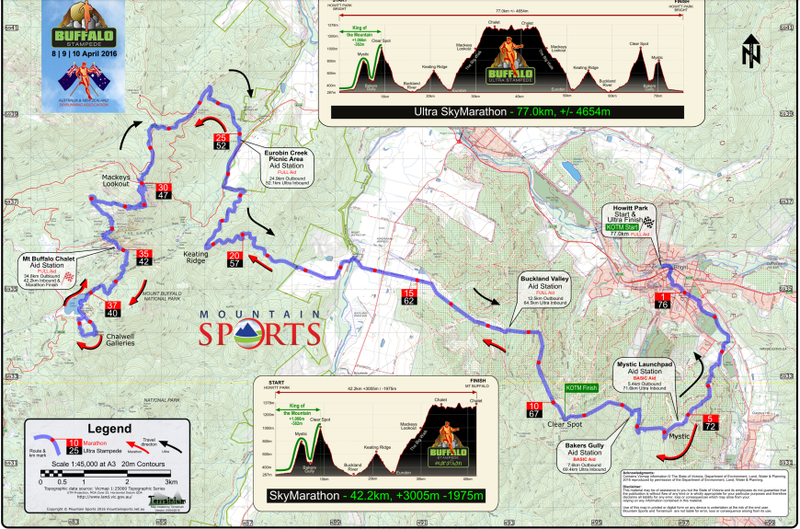 In 2017 the SkyMarathon will be a downhill course – starting at Mt Buffalo and returning to finish in Howitt park in Bright. The Buffalo Stampede SkyMarathon course takes runners on a tough 42km challenge taking in the unique scenery of the amazing Mt Buffalo in Victoria’s Alpine country. Starting at the old Cricket Pitch on Mount Buffalo – runners run onto the underground river trail and negotiate Chalwells Galleries before making their way down the Big Walk through Eurobin Creek Picnic Area and through the Buckland Valley to Clearspot. From here Bright is in sight and runners summit and descend Mystic Hill before a final run along the river to Howitt park and a heroes welcome and a large crowd in the centre of Bright.